I am a Sweet & Sassy stuffed unicorn, your life-long, mystical friend. I have a wonderfully huggable body and my soft fabric is a vibrant purple with purple hearts! My plum nostrils and hooves are soft and shiny and my purple mane and tail tuft are super fluffy. Oh, and my horn... it is my favorite feature, so lovely in soft, glittery lavender. Just look into my sweet face and you will see a fun rainbow of hearts in my beautiful blue eyes. And check this out... 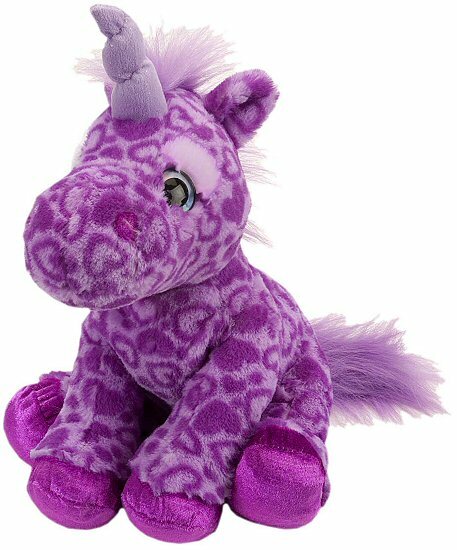 When you purchase me (aka Sweet & Sassy plush unicorn), a portion of the proceeds helps to provide housing and education for disadvantaged children, as well as protection for abandoned animals throughout the world. It's definitely a win - win - win situation!